The Victorian apartment where I lived, upstairs from the fabric shop I’d inherited, felt different from the Christmases that I’d spent when my great aunt and uncle lived here. Back then, I was a kid playing with the train set that ran across the base of the Christmas tree, eating home baked sugar cookies fresh from Aunt Millie’s oven while counting down the hours until Santa arrived. The tree was draped in homemade garlands made from strewn empty wooden spools of thread collected over the year. Pine needles dropped onto ivory crushed velvet that pooled under the lowest level of branches. A videotape of It’s A Wonderful Life played on Uncle Marius’s old TV set, and mugs of hot chocolate were served before bed. I did what I could to replicate my memories with the tree and the movie, but without the company of family, the place felt lonely. Even the antics of my adopted kittens, Pins and Needles, didn’t help. I’d tied fluffy red grosgrain bows onto each of their collars, but Pins was trying to bite at his. He bent his head and tried, unsuccessfully, to catch the bow in his mouth. Needles was far more interested in the trains that circled the tree. The doorbell rang. I ran down the stairs and found my new friend Genevieve Girard on the porch with my parents. Voices of merriment mingled with hugs and kisses. Charlie, the auto mechanic from across the street rolled a tire up the sidewalk toward me. “I brought you a wreath,” she said. “You brought me a tire,” I countered. “Sure. I knew that,” I said. I hated that Charlie knew I’d been wondering if her brother was going to show. I followed the group upstairs. My dad was in the living room, holding Needles over one shoulder while fussing with an assortment of cables by a dusty VCR. “Dad, I have It’s A Wonderful Life on DVD this year,” I said. Before I could argue the point of technology vs. tradition, the doorbell rang again. I glanced around the room. Everybody I expected was already here. I ran downstairs and opened the door to an ivory box tied with a thick satin ribbon. A flutter of warmth came over me. This wasn’t my first experience with an ivory box left by my doorframe. It was from Vaughn. I stepped backward and closed the door. Chitchat and music tumbled out of the upstairs, but I remained in the darkness below. I carried the package to the fabric cutting table and pulled the notched end of the ribbon until it fell open. The sweet, seductive scent of roses escaped the box. I lifted the lid and exposed an interior packed with petals. Nestled on top was a piece of sheer vellum with a VM embossed on top in gold. It wouldn’t be a wonderful life without Zuzu’s petals (or without you). Sorry I had to miss your party this year. I slipped the vellum back into the box and replaced the lid. After all that had happened since moving to San Ladrón, one thing was certain. It was turning into a wonderful life, indeed. 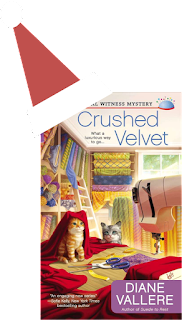 Leave a comment below about your favorite holiday tradition and be entered to win a copy of CRUSHED VELVET, book 2 in the Material Witness Mystery Series! Makes me wax nostalgic. Got to read this book! This does sound wonderful & I love the cover. We have a lot of traditions. Decorating the Christmas tree together is a great favorite. Thank you, Mary. I love decorating the tree, but hate trying to get those lights right! Good luck! Great story and love the cover. As I think about it, I realize we have a lot of traditions, starting with putting up the outside decorations right after Thanksgiving to reading The Night Before Christmas on Christmas Eve. Hi Grandma Cootie, I used to recite The Night Before Christmas on Christmas Eve myself. Forgot about that! Good luck! I have read the first book in the series, and I can't wait to read this one! Thank you for the giveaway. One of our family traditions is decorating the tree (which is fun). I also enjoyed the touring of the neighborhood (or town) to see the lovely decorations and lights. Thank you, Jen! Good luck! There is a park that decorates every year. We love to go. Debby, this sounds like a great idea. Let someone else do the work! Good luck! I like watching that movie every year too! But a family tradition is watching Holiday Inn together. Thanks! I will have to check out Holiday Inn. I don't think I've seen it. Good luck! Another great movie tradition. Good luck! I want to keep reading! Thanks for the chance! Thank you, Karen. Good luck! Thank you, Linda. I love this cover too!! Good luck! All great traditions, Daniele. Good luck! Thank you Robyn!! Good luck! Making gingerbread cookies with the kids and hanging the stockings. I bet your house smells really yummy! Good luck. My sister & I helping our Mam get things ready for Christmas Day. Family coming together, sounds lovely. Good luck! Hi Annette, sounds like fun! Good luck! Christmas dishes. My mom got a set from her bridge club back in the late 40s. I loved using these every year while growing up, Eventually they were passed on to me and then to my middle son. Now I have a few special dishes and mugs that I use all Dec and sometimes Jan! Looking forward to Crushed Velvet. HI Karen, I love the idea of Christmas dishes! What a great way to make this time of year feel extra special. Good luck! I love decorating the house on the day after Thanksgiving. Hi Sue, I've held my own decorating off for a bit, but it does always put me into the spirit! Good luck. Book looks like a good read. I enjoy decorating the tree and house with my sister the week before Christmas. Makes the house look so festive. Thank you, Dianne. I hope you and your sister have lots of fun decorating! good luck. A peace-filled time with loved ones. It's nice to find some peace this time of year. Good luck! I love that you focus on the tree. Decorating is so much fun. Good luck! We love driving around the neighborhood to look at all the cheerful holiday decorations! I agree, it's tons of fun to see what other people do! Good luck! Thank you, Ruth! Good luck! Jan, Poly Monroe has a memory of leaving cookies out for Santa, too, but she thought her blog post was getting too long so she took that part out :) Good luck! Sounds like my kind of read plus I love the cover!! Decorating my house. Each and every decoration means something and takes me on a trip down memory lane. And a happy trip it is! Lynne, I love that you have decorations that bring on memories of past Christmases! Good luck! Kay, I was just thinking about the hay in the shoe tradition. I never did it, but I read about that. How cute! Good luck! Family all together! Wonderful. Good luck! New Christmas PJs for the little ones--a great tradition! Good luck! Going to church to hear about the reason for the season. So sorry about the many posts. The website was not working for a while. Hi Elaine, I always loved the hymns during this time of year. Good luck! The cover is awesome and the story sounds like a lot of fun. One of my favorite Christmas traditions is driving around town looking at the beautiful Christmas lights and displays. Thanks for this giveaway! Thank you, Peggy. Good luck! An old tradition was my mom and I baking everyone's favorite cookie. We stayed up all night baking cooking. How early did you get up on Christmas morning? My sister and I weren't allowed to get up before 5:00. Good luck! Driving to Batavia, NY to get homemade ribbon candy from Oliver's. That sounds like so much fun! I just realized Poly probably hands out ribbon candy to her customers this time of year :) Good luck! Fudge-fudge-fudge! Sounds like you know what you like. Good luck! My favorite holiday memories are of plum puddings and Christmas crackers. My mother is from England and has continued the tradition with her children, grandchildren and great-grandchildren. This book/series sounds delightful! My favorite Christmas tradition is taking a Christmas jigsaw puzzle to the family gathering. We start the puzzle on Christmas Eve and finish it on Christmas Day. I started doing this back in the late '80's, so we've put together a LOT of Christmas puzzles! A family project! I love that idea. Good luck! cheers! I think everybody eats more than they play around the holidays, right? Good luck! No traditions but love to listen to christmas music. Even in sunny California, the music can put me into the holiday spirit. Good luck! This comes close to describing what I have planned for tonight! Good luck! Watched It's a wonderful LIfe the other night. However, our one unusual tradisiton is when we get the decorations out, we have a statue of Mary on a donkey with Joseph beside them. It's about 5 inches tall. Anyway, that statue travels around the livingroom toward the stable and on Christmas eve, arrives there. I wanted a way to make the true Christmas story come alive for my boys when they were growning up. We started it about 30 years ago and now it is tradition. What an adorable tradition! Good luck! This series looks wonderful! And I loved the tire wreath! My favorite holiday tradition is baking cookies and watching Christmas cartoons on Christmas Eve. Thank you very much for the chance to win! Thank you, Abby. So many cookies here. I wish someone would bake some for me! Good luck! I like to watch Christmas movies on TV and eat a turkey dinner on Christmas Eve. No kids and not much family that I see. peace and quiet! Good luck!